The launch of the Loft in 2001 started putting the collective experimentation of Yunnan’s artists on stage for the first time. Among them were the group exhibitions like “Experience” (2002), “Sheep is coming” (2002) and “Shadow” (2003) that showcased to the public the overall outlook of Yunnan’s post-70s local artists. Later on, they made their presence known collectively in Shanghai, Beijing, and other cities. A new generation of Yunnanese artistic forces had witnessed a dynamic development. Xue Tao, being one of the experimental artists and event planners from this period of time, has had a very important role in promoting this development. Xue was born in 1975 in Dali, Yunnan. He founded Yunnan’s first modern art community – the Red Heart Commune in Dali and later on the Migratory Sky Art Space in Beijing in 2005. He has always been actively promoting interaction between Yunnan’s artists and those from other places. He moved from Beijing back to Kunming in 2012 and devoted his efforts to introduce local emerging artistic talents, and to write articles for the young artists. As an event organizer, planner, and contact person, he has made great contributions to Yunnan’s local artist community. Xue’s artistic journey was typical among the post-70s artists. He began with the traditional academic arts, picked up the languages of colors and models along the way, and started to make art with modernist ideas and methods. After entering into the contemporary art in the context of globalization, he employs personal language to express his artistic concerns in such a scenario. 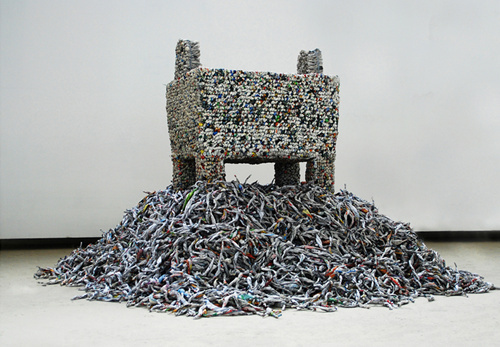 Xue has been creating installation works with newspapers since 2000. With clean and concise forms and their unique heaviness, his works add to the ordinary newspapers a special effect of unfamiliarity. Xue approaches the form experimentation at three levels, namely the forms concerning time, energy and language. On behalf of the Chinese artists, Xue was invited to participate in the European Tour of the “Chinese Power Plant” Art Exhibition in 2007 to 2008. This Exhibition highlighted the power of China’s younger generation artists, and it was highly acclaimed. Xue also attended one of Europe’s most prestigious art events – Biennale Internationale Design Saint-Étienne 2008 in France. Xue held his first solo exhibition – “Extraordinary Daily” in Shanghai, Beijing in 2007. Seven years later, he is to present his newspaper installation solo exhibition “Extraordinary Daily II” in his hometown – Yunnan. The location is exactly where Yunnan’s experimental art projects such as “Experiences” and “Sheep is Coming” were held – TCG Nordica. 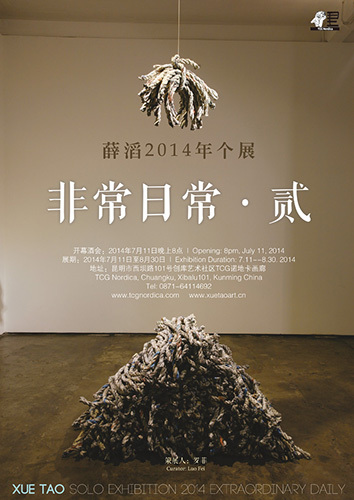 This Exhibition will focus on 14 representative works of Xue’s since 2007. It’s going to be his first installation art exhibition in Yunnan, testifying the ceaseless exploration in his artistic creation. The Exhibition will be opened at 8 P.M. on July 11, 2014 at TCG Nordica. We would like to cordially invite you to join us for a feast of installation art!